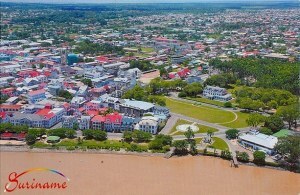 Paramaribo (nickname: Par′bo) is the capital and largest city of Suriname, located on banks of the Suriname River in the Paramaribo District. The area, a trading post started by the Dutch, was taken by the English in 1630, and in 1650 the city became the capital of the new English colony. The area changed hands often between the English and Dutch but it was in Dutch hands again in 1667 and under Dutch rule from 1815 until the independence of Suriname in 1975.